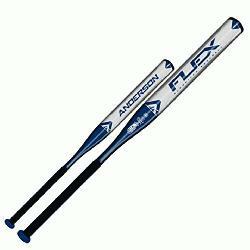 The Anderson 2015 Flex Slow Pitch bat is Virtually Bulletproof! Constructed from our aerospace alloy the one piece design is considered one of our most durable bats so you\ll never worry about your new FLEX denting or cracking in the middle of a season. The Flex Slow Pitch is a balanced bat made to give hitters just the right balance of power plus speed with a thin, buggy whip handle for generating more bat speed to snap the bat head through the zone plus a \x93muscled up\ barrel for extra pop and distance upon contact. The Reduced Moment of Inertia (the effort necessary to swing the bat) allows you to generate break neck bat speed without burning an extra ounce of effort. It\x like swinging a bat with the force of a sledgehammer with the effort of a fly swatter producing more powerful hits, massive ball speed and bigger offensive numbers. Never worry about blisters or tired, sore hands with the FLEX\x plush padded spiral grip which provides a pillow soft feel with leather tough durability. Don\t wait for your bat to \x93break in\, the Flex Slow Pitch Bat comes out of the wrapper white hot and requires just a handful of swings to be primed and ready for teeing off opposing pitchers.